Ospreys - Raptor Rehabilitation of Kentucky, Inc.
Raptor Rehabilitation of Kentucky, Inc. The Osprey, sometimes called a Fish Hawk, breeds near water, fresh or salt, where large numbers of fish are present across Canada and Alaska, around the Great Lakes and the east coast of the United States, AND on the Falls of the Ohio at Louisville, KY. They winter from southern Texas and the Gulf Coast through the West Indies, Central and South America. Ospreys have a white head with a distinctive dark brown stripe on their eyes going back to the nape of the neck. The female as a brown necklace of feathers around her neck. Flying Ospreys are best identified by their long and "crooked" wings, often held in an M posture. The name Fish Hawk is appropriate since they eat only fish. Unlike the Bald Eagle, when an Osprey spots a fish, it will stretch its feet and talons out as it dives completely into the water. A quick few flaps to rise from the water's surface are followed by a full body shake to eliminate the extra weight of the water as it flies off. Then the fish is carefully maneuvered into an aerodynamic forward facing position. They will defend their catches from marauding Bald Eagles trying to steal a fish. Nests may be built in dead or open-topped live trees located in or near the water. They have easily adapted to man-made nest platforms, or structures such as cell phone towers or bridges. A pair is monogamous and will return to a particular nesting site each year, renovating and enlarging the nest, so they can become quite large. The 2-3 eggs will be incubated for 34-40 days. Hatching is asynchronous, like most raptors, so the chicks vary in size. They will be ready to fledge in about 53 days, and will remain with the parents until time for fall migration. 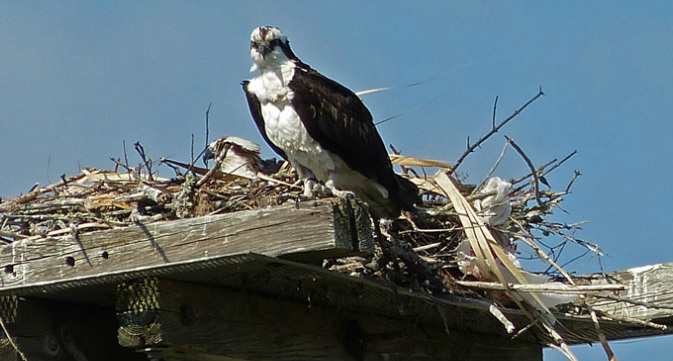 Ospreys were affected by DDT, just as the Bald Eagles, but they have made a good recovery.